What Does an HR Compensation Manager Do? Compensation managers are responsible for researching, establishing, and maintaining a company's pay system. This involves researching and understanding the current and upcoming competitive markets for employee pay and benefits. A compensation manager must find ways to ensure that pay rates are fair and equitable in order to retain and recruit employees. A compensation manager's duties depend to some extent on the nature of the company she works for. In larger organizations, a compensation manager might specialize in specific areas such as job classification or market pay studies. She's often assisted by staff specialists. An HR business partner or even a recruiter is often tasked with compensation functions in smaller companies. Compensation is complicated and can require good mathematical and statistical skills that not every HR employee possesses. Compensation duties often fall to the HR person with the best technical skills in smaller companies for this reason. It's unusual to find an employee whose sole responsibility is compensation in small and even mid-sized companies. The compensation manager would establish the pay grades that govern employees' levels and amounts of pay for government or civil service employers. These managers might conduct salary surveys to find out how their pay rates compare with those of other employers. They can also work with established online sites that specialize in compensation to do market comparisons of pay by region, number of employees, and job responsibilities. It's the compensation manager's responsibility to see that the company's pay scale complies with ever-changing state and federal laws and regulations. Depending on the needs of the organization, compensation managers might oversee their company's performance evaluation system as well. They might handle employee benefits, as well as employee reward systems such as bonuses, merit raises, and pay-for-performance plans. A compensation manager might work directly with a manager to help come up with a new job description that allows for a different pay band in order to help retain a valued employee who has reached a high level within her current pay band. 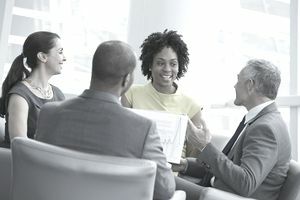 Although a good portion of developing a compensation strategy involves sitting behind a computer and looking at data, a good compensation manager also wears a business partner hat. Compensation managers meet with line managers to help develop promotion and retention strategies for existing employees. A compensation manager can find herself working closely with individual managers as well as HR business partners, HRIS experts, and the payroll department to ensure that raises are handled correctly and fairly. This position generally requires a four-year bachelor's degree with a major in a related field, such as economics, accounting, or human resources. Candidates should also have topnotch communication and writing skills. A knack for negotiating can be helpful, and these managers should be tech-savvy and highly organized. At least five years' experience in a similar occupation is usually preferred. How Much Does the Position Pay? Median pay for compensation managers was $119,120 annually in 2017, according to the U.S. Bureau of Labor Statistics. That works out to about $57 per hour. Job growth from 2016 through 2026 is estimated at average, about 5 percent. Hourly employees have been known to walk for a pay raise of $0.25 per hour. Salaried employees will jump ship for as little as $5,000, even if they like their current employer. When the company next door starts paying more, people start leaving in droves. Pay is critical to building and maintaining a great company. If your pay isn't competitive and your people aren't well rewarded, they won't care about the video games in the break room or free lunches on Friday. A good compensation manager can be one of your best retention tools when you use their skills and value-add effectively. The last thing you want is to lose an employee who adds significant value to your company. Just make sure that your compensation manager is compensated appropriately. for their contributions. What Does a VP Do? What Does a Manager Do in the Workplace?